"The company was so alarmed when the Guardian revealed the true nature of its business that it woke a judge in the middle of the night to try to gag the paper and its website." "Congress did not intend to provide foreign tax credits for trans­actions such as Stars." 1) Support genuine commercial activity. 5) Be consistent with, and seen to be consistent with, our purposes and values. "You could write "no shifting profits into shell companies" into every tax statute in the world (plenty already have it) and it wouldn't achieve much. The point is they don't have to use shell companies. They can easily ensure there is some real activity. You put your intangibles in a Dutch company with 20 employees, call them brand managers and claim it's commercially sensible to do all this centrally. Ditto financial capital in Luxembourg. Certainly not shells but still earning vastly disproportionate profits. In fact this is the big tax avoidance game at the moment. . You act against the "aggressive" stuff while completely backing off anything with a veneer of commerciality (and in the UK's case throwing tax breaks at it). The campaigners get a result and governments can claim to have done something but situation gets worse." "The U.K. taxes at issue did not arise from any substantive foreign activity." 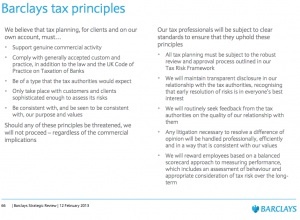 So principle 1 would appear to at least rule that out - though again, only with the proviso that Barclays sticks to the spirit of this commitment. They will have to earn our trust that they will do the right thing even on this feeble set of principles. Given the history, that's a whole lot of earning to be done. "If this is Barclays moving towards acceptability I am going to take a lot of convincing. Where’s the mention of the spirit of the law? Or transparency? And what about foregoing the use of tax havens? What about consistency between substance and form? None of these are mentioned. Sorry, but in my view this is a tax avoiders charter, not a move into the light. The fact that this was also on page 66 of 67 says a lot, I think." Barclays is ordering temporary workers to establish themselves as VAT-registered company contractors in a tactic that has been labelled an "extremely cynical ploy" to . . . enable Barclays to avoid a range of employment obligations and the need to pay NICs." to get harmful tax practices in countries that are members of the 'club' (via EU and full low source state tax treaty networks) stamped out. The latter is primarily for the EU, but the OECD could say it's OK to suspend treaty rights when the use of a harmful tax practice is involved. For example, a country doesn't have to allow royalty payments at the lower treaty rate of withholding taxes if it suspects they're benefiting from the Dutch royalty regime." Which all sounds very sensible.